This recycling idea is commonly done as a students’ classroom activity/project which provides lots of educational benefits to the children. They can use it as a playhouse or a reading nook. Milk jug igloos are very easy to build as the only tool you will need is a hot glue gun. The time to build one, however, is the most ‘difficult’ aspect since you will have to collect around 500 pieces of plastic milk jugs for a spacious igloo. 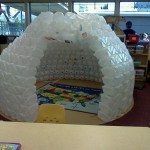 But if you have access to lots of empty plastic milk jugs, then the kids can have an awesome igloo of their own in no time! Want to build a milk jug igloo with the kids? Learn more about it from the article by Hubpages linked below! Do you know someone who will like this idea?